"From the Frontlines" Live Today 4 PM to Midnight EST ...Update: Goal Surpassed- Over $1, 055,719 Raised for the Troops! Wow! "From the Frontlines" Live Today 4 PM to Midnight EST …Update: Goal Surpassed- Over $1, 055,719 Raised for the Troops! Wow! ** Call 866-866-6372 to donate. The folks at “From the Frontlines” are accepting donations from all 57 states. Melanie Morgan and Michelle Malkin will be anchoring a livestreamed, 8-hour fund-raising “web-a-thon” to send the largest number of care packages to our troops overseas in U.S. history. You will be able to watch it live here from 4 to midnight EST. Move America Forward is hoping to reach $500,000 or half a million dollars raised for the US troops serving their country in Iraq and Afghanistan. ** You can donate to this great cause HERE. 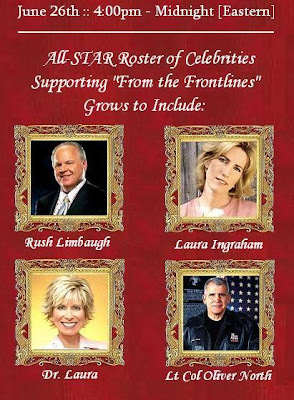 The star-studded line-up participating in this effort to support our military, included: Rush Limbaugh, Sean Hannity, Mark Levin, Laura Ingraham, Dr Laura Schlessinger, Ollie North, Monica Crowley, Ann Coulter, Nancy Reagan, actor Kelsey Grammer, and Five for Fighting’s John Ondrasik and more. 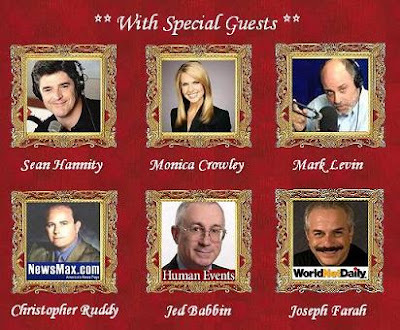 This ought to be a great event. I hope you will tune in- Hope you will donate, too. UPDATE: (5:13 PM EST) The todal just jumped to $297, 283! UPDATE: (5:40 PM EST) Michelle and Melanie just appeared on The Laura Ingraham Show on FOX News to talk about today’s exciting event. 2500 viewers– jumped to 3053 viewers after the segment on FOX. UPDATE: (8:10 PM EST) “From the Frontlines” goes over the top!! $592,916 raised for the troops!! UPDATE: (9:30 PM EST) The total is now at nearly $698,011! UPDATE: (9:45 PM EST) Michelle Malkin breaks down in tears after listening to a US soldier tell her story about her immigrant family… Very touching. UPDATE: (10:30 PM EST) Total– $837, 997! UPDATE: (11:25 PM EST) Total — $980, 023!! UPDATE: (11:55 PM EST) Grand total for today’s webathon– $1,055,719!!! Congratulations to Michelle Malkin, Melanie Morgan and to all of those who helped make this an amazing success! !